Matthew and Luke wrote independently, with Mark and Q as source material, as well as unique independent source material. I came across something that would seem at first glance to challenge this. Mark 4:30-33 is the parable of the mustard seed. Matthew 13:31-32 and Luke 13:18 are clear parallels. Then Matthew and Luke both insert the parable of the leaven in the very next verse (Matthew 13:33; Luke 13:20). I suppose an explanation is that Q and Mark both had the mustard seed, and Q alone continued to the leaven. Is this plausible? Or this could be a remarkable coincidence. Perhaps they were both independently listing the "Kingdom of Heaven is like..." passages and got a similar order in this case. Or are there other explanations that make more sense? Here is a link to the relevant passages. A fundamental problem of this question is the a priori of "the current consensus of the writing of the gospels". Such a consensus does not exist. This two-sources-theory is just one of several attempts to reconcile the difficulties in explaining the synoptic problem, and admitted: fairly popular at that. As long as the various source hypotheses remain hypotheses, the synoptic problem shall remain unsolved and even unsolvable. The nature of any hypothesis is that it cannot account for all of the data all of the time, for in so doing it would cease to be a hypothesis. The data presented by the synoptic parables of the Mustard Seed (Mt. 13.31-32//Mk 4.30-32//Lk. 13. I 8-19) and the Leaven (Mt. 13.33//Lk. 13.20-21) afford us with a valuable opportunity to test the claims of each of the three current and popular solutions to the synoptic problem – the 2 Document Hypothesis (2DH), the Two-Gospel Hypothesis (2GH) and the Farrer-Goulder Hypothesis (F-G). It is not uncommon to read studies that either state explicitly or work under the assumption that the synoptic problem has been solved. Using the parables of the Mustard Seed and the Leaven as a test-case, it becomes clear that the problem is far from a solution. Each of the three major source hypotheses has its strengths (and weaknesses) when it attempts to account for the data generated by these two pericopae. Although this paper concludes that the Two-Document Hypothesis (2DH) deals with the data with the fewest problems, the strengths of the other hypotheses coupled with the weaknesses of the 2DH should help keep the 2DH honest. It is therefore currently not possible to reach a definite conclusion. Whole dissertations try to solve the problems with this passage, for example: Franz Kogler: Das Doppelgleichnis vom Senfkorn und vom Sauerteig in seiner traditionsgeschichtlichen Entwicklung, Echter Verlag: Würzburg, 1988. This makes it reasonable to think that Luke found it in Q and left it there. But this is just for this pericope and only comparing three of the popular theories. For the whole synoptic problem the findings presented are much more limited in problem solving and should only be read as an indicator, not as proof for the whole theory. That a pericope is triple tradition is generally sufficient to show that Mark is the only source for Matthew and Luke. The Mustard Seed presents certain problems for this. While the degree and nature of the agreements between Matthew and Mark (see Table 1) demand direct literary dependence, the agreements between Mark and Luke do not. There are several features that suggest Lukan independence of Mark here. The words Luke shares with Mark are weak; they do not add anything significant to the meaning or application of the parable. Additionally, the only material which shows that Luke and Mark are even telling the same story is the triple agreement material; therefore, there is nothing to demand Luke’s reliance on Mark. Further, all the double agreement words of Luke/Mark against Matthew are comfortable enough in Luke that there is no need to suggest Mark’s influence at all. 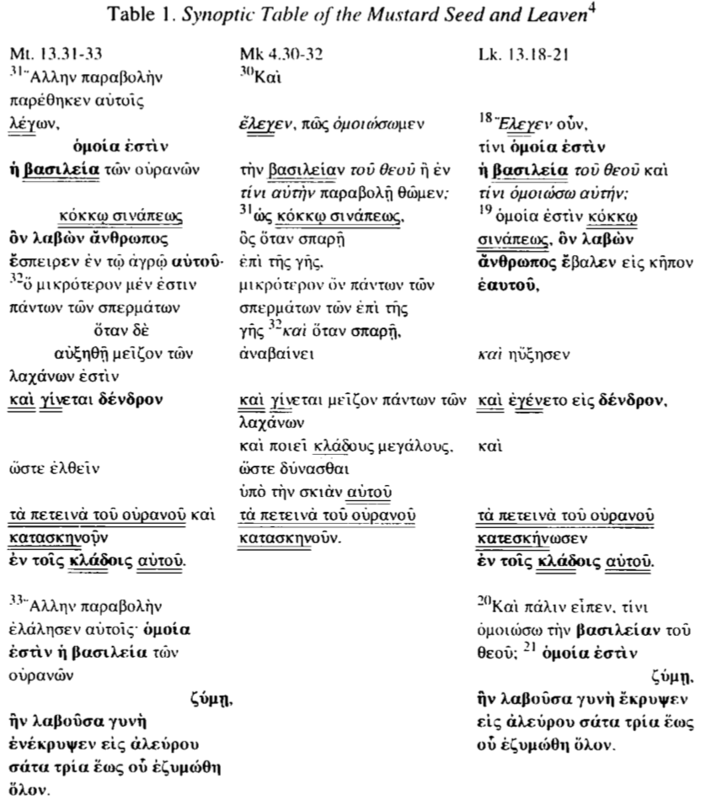 The τινι (v. 18a) which Luke appears to take from Mark is actually part of a Lukan construction (τινι ομοισς) which Luke uses without Markan parallels (Lk. 6.47; 7.30; 13.20). This suggests that Luke need not have obtained this word (even as minor as it is) from Mark. The unnecessary order of the two parables also supports the contention that two versions of the Mustard Seed survive in our text. Therefore, according to the 2DH, two different versions of this parable are preserved in the synoptic Gospels––that of Mark and Q. […] Tuckett suggests (for the Mustard Seed) that while Mark was working from an earlier source, our parable offers no reasons to assume that Q itself (in the form available to us) is that source. The basic problem with proposing too many Mark/Q overlaps is the nature of the evidence; the data that alerts us to the possibility of a Mark/Q overlap, namely that Mark shares so little in common with Matthew/Luke(Q), is the same data that militates against Mark’s relying directly on Q. There are three problematic words in Luke which the 2DH sidesteps by suggesting Luke found them in Q. If this is not entirely satisfactory, it is a far better hypothesis than could be suggested by the 2GH or F-G hypothesis who, as we shall see, must ascribe them to Lukan redaction. These words are κηπος and βαλλω in the Mustard Seed and παλιν in the Leaven. There is little to indicate that Luke ’liked’ κηπος and hence may have been predisposed to add it to his source, since it occurs only here in Luke (and never in Mark or Matthew). This makes it reasonable to think that Luke found it in Q and left it there. The image of impurity that is created by planting mustard in a garden is mirrored in the Leaven, and thus might have been a part of the original radical parables. So, while it remains impossible to account for why Matthew removed παλιν from the Leaven, its occurrence in Luke’s Leaven is best explained by his finding it in Q and keeping it as he had before. We have seen in the course of this study that the three popular and current source hypotheses can account for some of the data quite adequately. This is not surprising; if they were not good to a certain degree, we should be surprised that they had any adherents at all. Not one of them was able to account for all the data equally well; some encountered problems dealing with specific words, others with presenting coherent redactional procedures. What separates the source hypotheses is not that one of them can answer all the questions posed to it, but that one has the fewest problems. It might be a sad state of affairs that we need to accept as the better answer the one that fails the fewest times, but this is the current state of the synoptic problem. For the Mustard Seed and the Leaven, the Two-Document Hypothesis deals with the data in the least problematic manner. As one answer already noted, and your comment later in the question indicates there is not a anything like a real consensus to the how to solve the synoptic problem. "as well as unique independent source material." One solution to the problem that is often overlooked is the idea that each of the authors wrote independently. This position is represented by a number of authors, but Robert Thomas' and F. David Farnell's work The Jesus Crisis: The Inroads of Historical Criticism into Evangelical Scholarship is one of the better. They point out that the solution to the verses you mentioned is that Jesus gave a lengthy discourse that was repetitive in nature with the differences coming from the way the material was repeated. Back in the nineteenth century Benjamin Warfield pointed to verses like Mark 10:17 and the imperfect verb -- the disciples kept asking as an excellent example of how the disciples asked the same question multiple times and Jesus answered multiple times with slight variations each time. Inherent to the independent view is the idea that no one gospel records everything Jesus said on a particular occasions. In fact there may have been multiple occasions where the same subject came up again and it only appears that it was one occasion. For example: the sermon on the plain may have been a repeat of the sermon on the mount, with some minor differences. The authors of the Jesus Crisis state that this method of harmonization is called the "additive-harmonization approach" by those who are critical of this method. That might serve as a useful phrase to search in Google to learn more. Markan priority has very strong evidence and is held by almost all critical scholars. But although the two source theory (i.e. that Matthew and Luke independently used Mark and Q but not each other) is the dominant position, it is not held as universally because of some nagging problems with it. You've found exactly one of these nagging problems. There are several passages where Matthew and Luke agree with each other and disagree with Mark, which is unusual and notable because on the whole the pattern is strongly for Mark to agree with Matthew or Luke against the other. In addition to your example, two similarly difficult passages are Matthew 3.11-12/Mark 1.7-8/Luke 3.16-17 and Matt. 4.1-11/Mark 1.12-13/Luke 4.1-13 (see here). The most common argument given by people who hold to the two source theory is that these major agreements between Matthew and Luke against Mark come from passages where Mark and Q themselves overlapped. So even though this passage is in Mark, Matthew and Luke are both taking it from Q instead of Mark. By contrast people like Goodacre who hold that Luke used Matthew would just say that Luke was following Matthew instead of Mark in this passage. To test these hypotheses, we can look at the Eusebian Canons, 4th century harmony of the Gospels that organized each Gospel into passages (not verses - those didn't exist yet) and indexed the passages according to whose Gospel they were in. In the Eusebian system, there was a table indexing passages that were in all four Gospels; a table indexing passages that were in Matthew, Mark, Luke, but not John; a table indexing passages that were in Matthew, Luke, John, but not Mark; etc. According to this table, there are 190 passages that are common to Mark, Matthew and Luke. (I'm rounding to the nearest 10, because I am counting entries in a hardcopy I have). These would have been the passages that Matthew and Luke would have copied from Mark under the Markan priority hypothesis. Some or all of these could have been in the hypothetical Q document. Further, there are about 90 passages that do not appear in Mark, but appear in Matthew and Luke. These definitely would have come from the Q document, if the Q hypothesis is correct. In Matthew, there are about 70 passages that are in neither Luke nor Mark. If we were to stop here, then we could say that Matthew is about 20% original work, around 55% Mark, and around 25% Q, although Q may have contained the Markan verses as well (we don't know). Luke would be around 25% original work, 50% Mark, and 25% Q, where again we don't know whether Q contained all of the Markan verses in addition to original content. There's a little bit of a wrinkle here in that there are around 50 passages in Matthew that are found in Mark but not Luke, and around 10 passages in Luke that are found in Mark but not Matthew. Presumably we would attribute this anomaly to sloppy copying on Matthew's and Luke's part. They either misread the copy of Mark they had or had corrupted copies. Not the answer you're looking for? Browse other questions tagged matthew luke mark synoptic-problem q-source or ask your own question. Which is considered more reliable about Jesus' words, Mark or Q? What was Luke's relationship to Paul regarding Christian matters, and thus their texts' relationships? What are the common solutions to the minor agreements of Matthew and Luke? What is the argument against the idea that a Hebrew Proto-Matthew is the Q source? What is the meaning of the yields in the parable of the Sower? How do 'usury', a 'table' and 'exchangers' relate to the Prototokos?